Matting your photos is a great way to make your photos stand out on your pages. On this layout I have also matted several other components on the page to provide a strong contrast between the different elements. I have used a dark colour to do this resulting in a bold design. 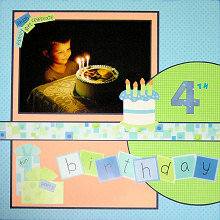 This layout was created using Beary Patch Blueberry Dot paper, Green Gingham paper, orange Bazzill cardstock, dark blue cardstock, blue patterned paper (for the four), small blue alphabet stickers, blue ink and Doodlebug Designs Birthday Boy stickers. Ink the edges of the Beary Patch Blueberry Dot paper with blue ink and set aside for your background. Cut a piece of orange Bazzill cardstock measuring approximately 195.cm by 26.5cm. Mat with dark blue cardstock and adhere to your background approximately 1.7cm from the top and left edges of the page. Mat your photo with dark blue cardstock. Adhere towards the top of the orange cardstock, as shown in the picture. Cut a circle from green gingham paper. The diameter of the circle should be approximately 19.5cm. Trim one side to fit your page. Mat with dark blue cardstock and adhere on the right side of your page, as shown in the layout above. It should overlap the bottom right corner of your photo. Mat the border sticker from Doodlebug Designs Birthday Boy stickers with dark blue cardstock. Adhere across your page approximately 11cm from the bottom edge. Adhere the birthday cake sticker in the bottom right corner of the photo, as shown in the layout above. Position two birthday presents stickers in the bottom left corner of the orange cardstock, as shown in the layout above. Add a word to each one so that the look like gift tags. Adhere the letters of birthday across the page, underneath the border sticker, as shown in the layout above. If you wish, add journaling or a date underneath the birthday letters in the bottom right corner of the orange cardstock. Cut the number 4 from a scrap of blue patterned paper. Adhere on the circle above the border sticker. Use small blue alphabet stickers to add the 'th' next to it. Finally, use some of the remaining word stickers to create a photo corner in the top left corner of the photo, as shown in the layout above.